At first blush, the Plantronics Voyager Pro appears clunky. The $99 (as of 4/4/09) Bluetooth headset sports a bulky, boat-shaped earhook (which houses the battery unit), along with a lengthy, pivoting boom microphone. But the more I used this headset, the more I came to appreciate some of its attributes. 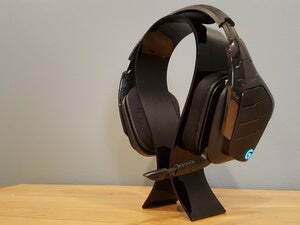 Affixing the headset to the ear requires both hands, and the thickness of the hook makes maneuvering it a bit more awkward and time-consuming compared with the effort required for most of the other hook-based headsets I've tested. After a regular routine of accommodating the hook over my ear along with my eyeglasses, twisting and pushing the earpiece into my ear, and pointing the boom down toward my mouth, I arrived at a comfortable fit. But since I have small ears, I had to get the earpiece positioned just so, every time. That said, the Voyager Pro's meaty hook did not feel cumbersome on my ear. And to my surprise, even after wearing the device for a couple of hours, my ear did not feel achy or dragged down. Again, however, I had to get the headset perched just right to ensure a fatigue-free experience. (No, I can't say that I forgot I was wearing the Voyager Pro.) At roughly 3 inches, the Voyager Pro's boom is longer than those of all the other headsets on our current chart, but the way it nestled against my cheek was not bothersome, either. I liked how the company presented its earbud extras. The package includes three gel-based eartips, or earbuds (small, medium, and large), and these buds are self-contained units, shaped like mini-pyramids, that lock into the earpiece. The gel feels soft in the ear, too. The company also provides two foam eartip covers. I found the call quality consistently splendid. Voices coming into my ear sounded up close and clear. At the other end, my talking buddies regularly praised the quality of our calls. My voice sounded clean and natural, with no choppiness or echoes. Callers reported that my voice sounded better when I used the headset compared with talking directly into my phone. (Calls at my desk generally sounded slightly better than those in the car.) One person I called commented that during a couple of sessions, my voice sounded a tad "metallic," or robotic. The Voyager Pro did a good job handling background noise. My pumping tunes faded somewhat, particularly when I was yammering, and callers could hear something far off in the background--a faint clacking noise that sounded something like a train braking on the tracks. Those sounds were not distracting, they said. Other noises, such as children's squeals, were picked up, but they were often indistinct. Nevertheless, in my tests the Voyager Pro failed to surpass the noise-cancellation performance of the Aliph Jawbone Prime. In windy environments, the Voyager Pro operates remarkably well. I made some calls during a moderately blustery spell at San Francisco International Airport, and we could carry on a conversation with no problem. At the other end, the person I called could tell that wind was gusting, but at no point was my voice inaudible. It simply didn't sound as crisp--more "smudged." The Voyager Pro did not pick up much of the curbside ambient noise, such as the busy comings and goings of cars or the rumblings of a jet during takeoff. The call control (or multifunction) button gets a big thumbs-up: It's supereasy to find--right on the center of the ear. You can tap the call control button once to answer or end a call, double-tap it to redial, or press it for 1 second to activate voice dialing ("Call Sunita mobile"). Plus, it delivers a terrific response when pressed, issuing an audible indicator (various tones, depending on your actions) and firm tactile feedback. In contrast, the other function buttons were somewhat tricky to access at first. The volume-up and -down buttons are located near the crest of the hook, and until I got the hang of it, I wasn't always sure if I had hit the button I wanted. And even though I like headsets to have a dedicated power button, the Voyager's power button is all the way down near the end of the hook, and initially it was not easy to find by feel alone, either. If you don't want to spend more than $100 on a Bluetooth headset, and your calling environments will include windy situations on a regular basis, the Voyager Pro is a great candidate. It's not the best-looking headset in the world, but your conversation--and others' voices--will consistently come through loud and clear. Take advantage of the Voyager Pro’s impressive wind reduction during calls--and expect great audio quality, to boot. You’ll have to be content with this Bluetooth headset's chunky design, though.